Children of Kpachelo, Northern Region, Ghana. 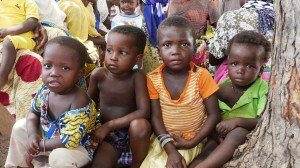 More than twice as many children in northern Ghana experience malnutrition than in southern Ghana. The latest estimates from the UN Food & Agriculture Organization indicate that more than 800 million people were undernourished in 2012–14, down more than 100 million over the last decade. While this would seem to be good news, one form of hunger that is often ignored or overshadowed is hidden hunger—also called micronutrient deficiency—which affects two billion people worldwide. Hidden hunger is highly correlated with chronic food insecurity, or the inability to obtain sufficient, healthy, culturally-appropriate food in adequate quantities on a consistent basis. The expression “I don’t know where my next meal is coming from” is a classic description of food insecurity, which people may experience even if the country they live in, overall, has made strides to reduce poverty and achieve the first Millennium Development Goal: halving the number of people living in poverty by 2015. Case in point is Ghana. Family farming. 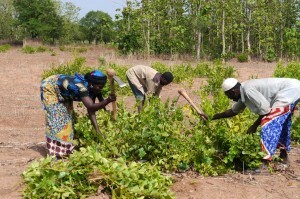 Wasila Mohammed (left), with husband Osman Naporu (right) and son Swale Osman (back) clear weeds from their two-acre farm in Yilikpani, Northern Region, Ghana, preparing their land as they wait for the rains to come for the 2014 growing season. According to the UNFAO’s stats, Ghana is one of 26 countries that has achieved the greatest improvement in overall poverty reduction (by 50% or more) and a corresponding reduction in their Global Hunger Index (GHI). Yet, it is also one of the countries that continues to experience great inequities on a regional basis in terms of poverty, hunger and malnutrition. The Northern, Upper East and Upper West Regions of Ghana have some of the highest rates of malnutrition in the country, with four out of ten children under the age of five stunted or chronically malnourished. In the Upper East Region, nearly thirty percent of people do not have adequate access to food, compared to a national average of five percent. During the height of “the hunger gap” – the period before the single annual harvest, when food and income runs out for many farming families – mothers typically reduce family meals from three, to two, to sometimes one or none daily. In work that CFTC has been doing as part of the Climate Change Adaptation in Northern Ghana Enhanced (CHANGE) project, many community members have reported to CFTC that they need to forage for wild fruits and vegetables to supplement their families’ nutrition. 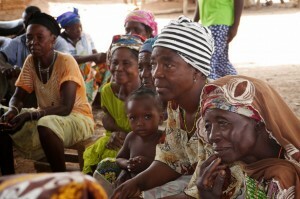 Women farmers of Wellembelle, Upper West Region, Ghana. There is now greater participation by women in farmer-based organizations and climate-smart agricultural training, and that ultimately means more food for their children. The hunger gap is widening, largely due to the effects of climate change and years of subsistence farming practices which have left the land unproductive, reducing farm yields and further entrenching poverty in these communities that are already living on the brink. It is the cumulative effects of poverty and chronic under-nutrition that leads to long-term consequences on children’s health, and the unfulfillment of human potential. Ghana exemplifies the problem of hidden hunger: looking at the stats at a country-wide level will mask the real state of under-nutrition and its consequences for millions of people, particularly children and women. Yet Ghana also exemplifies the potential for communities themselves to overcome the extreme challenges of climate change, poverty and chronic food insecurity. CFTC has been working to address chronic food insecurity for northern Ghana’s smallholder farmers through both its core and CHANGE project programming, which focus on climate-smart agricultural development and livelihoods for women in the three regions of northern Ghana. These are recognized as keys to eradicating ‘hidden hunger’ by providing long-term, sustainable solutions to micro-nutrient deficiencies through crop diversification, higher-quality produce from indigenous seeds, proper and safe seed and food storage, promoting dietary diversity, and empowering women in decision-making and participation in economic activities that lead to increased household income and more equitable distribution of resources (including food within a household). New techniques for seed storage to reduce post-harvest losses include these traditional mud-and-thatch structures. 2014 has been designated by the UN General Assembly as the International Year of Family Farming, and this year’s World Food Day theme, “feeding the world, caring for the earth,” reinforces that focus. CFTC’s work to support Ghana’s smallholder farm families will remain focused on long-term, sustainable and community-led practices that create a positive impact on the lives, health and hope of the children, women and men living there.